Geronimo Body: Cream body, pins in shoulders. Accessories: Yellow headband, Soft medium brown, hard dark brown. Horse: Both white and dark knee paint version of Bay (dark brown) Storm Cloud, with Ind. 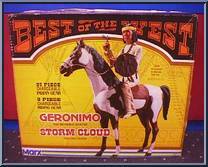 . .
Thunderbolt is the larger stiff molded horse used for mainly Johnny & some others. Comes in both Bay (dark brown) and Palomino color. Johnny Body: Carmel, closed hands, rivets in shoulders, mediu. . .